Even though Robin Hood was said to be a thief, he was always transparent with his motives and profession. He was clear that his job was the steal from the rich and give to the poor – a sympathetic sentiment for most people. But his true job was adventurer extraordinaire – living a life most could only dream about! 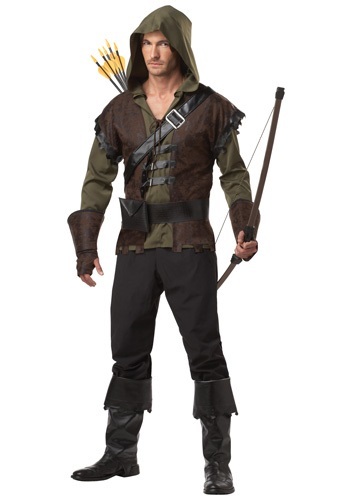 Whisk Maid Marian away to Sherwood Forest in this Robin Hood costume! Be the legendary English hero who may not have really existed. Did you know that historians have never definitively identified who he was? Most think that the mythical character is based on tales of many different men. We don't really care and suspect you won't either. With this classic costume look no one will be confused as to which character you're portraying! Get a look that everyone will swoon for this Halloween with our Robin Hood costume. This costume will transform you into that handsome hustler for a great price. The costume comes with an olive green hooded shirt/vest combo that has long sleeves and a front placket laced with cord. The brown faux suede vest panels fasten at the front with three buckled straps. This costume is full of detail, too. With matching gauntlets that have padded forearm guards and a pouch for all of your gold attached to a black faux leather belt, you’ll be ready to hit the town for an evening of chivalry at its best. Don’t forget to add black pants, boots, and a bow and arrow to complete the historical storybook figure’s look.